A short walk takes you by the twin Wesquage Ponds onto Bonnet Shores Beach, with great views of the Jamestown light house and the Atlantic ocean. You will be minutes from Newport, Jamestown and all the South County attractions. The water view from a wrap around deck is picturesque. This home is spacious and offers two large family rooms and a game area with a ping pong table, fooseball table and multiple games, a teenagers delight. It offers a palatial master suite with a private bath and a large walk in closet. It is a accompanied by a fully applianced and well supplied kitchen and a separate full laundry room. It also has a beautiful large yard for games such as volley ball etc.. There is an outdoor shower with hot and cold water supply. There is an outdoor shed to store golf clubs and beach toys etc.. Ample off street parking. Available for the URI academic year or for summer rental. We have a great love of the water. It gives us great peace and tranquility. We are local and available for any help you may need to make your summer vacation enjoyable and memorable. We are both locals born and bread in your vacation destination and have a great appreciation for the area and a deep awareness of how to maximize all it has to offer. It is a beautiful location. We were fortunate to live here our whole lives so we naturally bought here when it was time to settle down and become home owners. Short walk to Bonnet Beach and the Atlantic ocean and all it's beautiful views. There are many attractions within minutes of this location. It offers great fishing, kayaking and paddle boarding. We are a ferry ride from majestic Block Island and Martha's Vineyard. Great family gathering facility. Plenty of space for all to enjoy. Very close to many attractions. Clam boil pot provided for those New England lobsters! Storage shed available for bikes, golf clubs etc. Very large yard for family games bring allt he toys. Perfect spot to make vacation memories! This house offers everything as described! We just got back from staying at this amazing home on Bonnet Shores which provided a beautiful place for family bonding and memory making. There are 14 people in our group ranging from 4-64 and there was plenty of room for everyone. We took advantage of the yard for games, the kitchen for luau and mardi-gras parties, and the large table for family dinners and card games. Morning coffee on the deck with the sounds of the ocean was a favorite of the early risers. The owners are friendly and helpful and the house is in pristine condition with plenty of parking. During our stay we visited Newport, Point Judith as well as 3 easy to get to beaches, Narragansett Town Beach was our favorite. Hope to vacation here again next summer! Danielle, thank you for the wonderful review. We are so glad you enjoyed your stay. We are looking forward to seeing you next year!! Back again the third year in a row! I thought that I left a review from our last family vacation in 2015, but did not see it there. You can certainly believe the previous reviews for this house and their wonderful owners. The summer of 2016 is fast approaching and I recommend that you act quickly to secure this gem of a house. Without question my family and I plan to be there for the early summer! My actual date of arrival is late June 2016. Thank you so much Jim! We try hard to make sure everyone is happy and enjoy themselves. As you know, we are always near by if you need us. We do make sure the home is well equipped for cooking. When we do family vacations, we all love to cook. Looking forward to seeing you again this year Jim! We have been renting in the Narragansett Beach area, including Bonnet Shore for many years. Thisis the first time at this house and It was wonderful. The very best house we have ever rented. This year we rented for two weeks for a family reunion as we do every year. We slept 13 people from the age of 15 through 84 and barely knew there was a crowd. Another 5 people were usually in the hoouse. One of our daughters lives close by in Wakefield and she, her husband and 3 college age kids were at the house most evenings for games and dinners. So a total of 18 plus one to be born in September. The house is immaculate with everything they promise and more. The most well stocked kitchen ever with every pot, pan, cutlery you could think of. Close to all the good eating spots, especially Matunuck Oyster Bar and our favorite Monahans lobster shack with best value lobster rolls and other great items. We plan to come back next year and for many years after that. It would be redundant to keep heaping praises on this house, because all the previous reviews cover even more than we could. One more thing - Owners are local and are on call, even late at night for emergencies if need be. They are great. This house was the perfect place for our family to spend our vacation. We have been renting from Nancy and Tony for the past four years, and we cannot wait to come back again next year! The house was spacious and clean, and it had everything we needed to make this rental feel like home. All of us enjoyed using the ping pong and foosball tables, watching DVDs together at the end of the day, and sitting outside on the large deck and seeing the water. The best part was that the beach was only a few minutes' walk from the house. We had a great time staying here! This was the perfect place to gather for a family reunion. This house is spacious, clean and comfortable. We were delighted to find that all 12 of us could sit down in the kitchen for our dinner. The house is designed for fun and relaxation with game room, large porch, and a beach not far away. Nancy and Tony have thought of everything a family might need to ensure that our stay was perfect. Highly recommend this rental. We were delighted with entire experience. A great place to rent!! 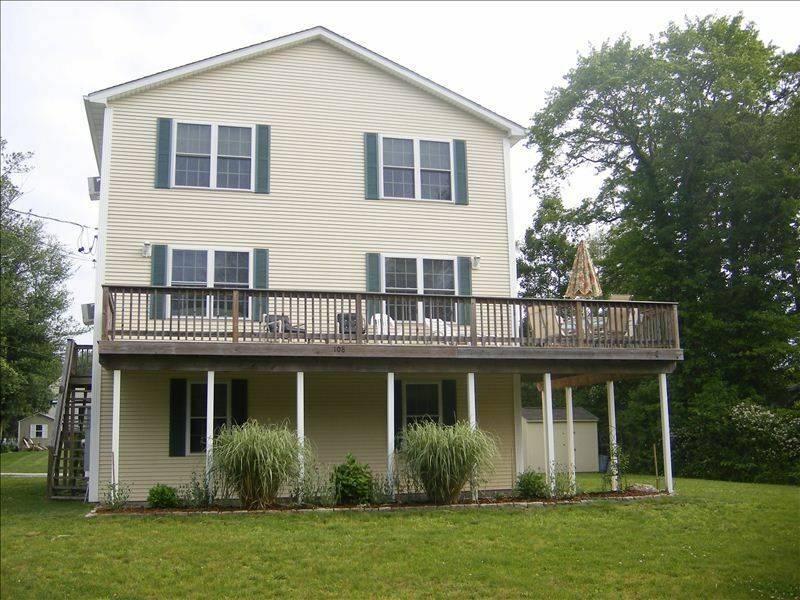 This house is a wonderful value in the Bonnet Shores area. The owners are exceptionally nice and approachable if you have any questions. I plan to return next year, and would recommend their house to friends, family, and readers alike! The Bonnet Shores location has been a family favorite for many years. The Matunuck Oyster Bar, Brickley's Ice Cream, and Ocean Mist (for breakfast and evening live entertainment in East Matunuck) are nearby. Thank sooo much for your great review:) You left it just like it was your own. Next year we will have more fun things to do in the game room. Then you and your family can even have more fun!!!. Looking forward to your return. Till then, have a happy and healthy year. 12 minute walk to Bonnet Shores beach! Minutes from historic Newport. Minutes from the ferries to both Block Island and Martha's Vinyard. Great kayaking areas. Minutes from picturesque Jamestown .